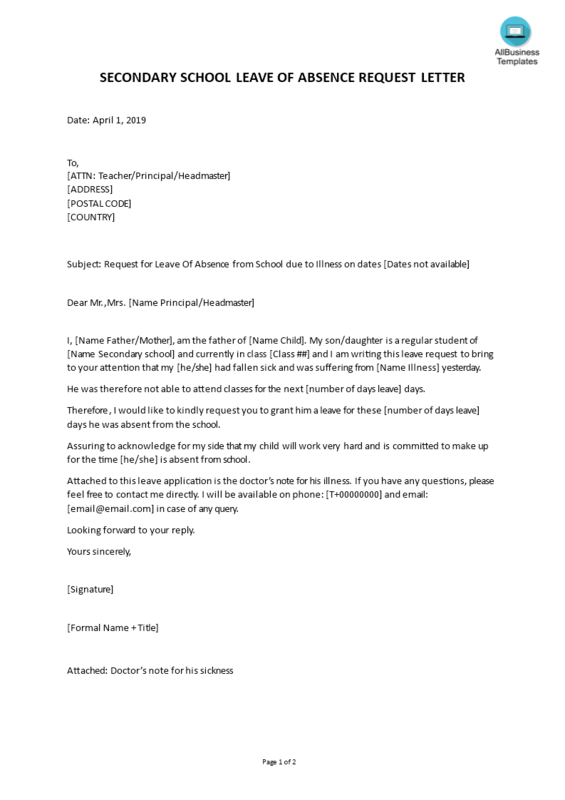 Make use of our leave letter template to help to come to a perfect personalized version. The objective of writing this leave letter for school is to request a period of leave for a temporary leave at the secondary school. It will mainly depend on the reason you apply for leave, whether or not you want to use a formal intonation. Please note this template is provided for guidance only. Download this Letter For Leave Secondary School template to write a perfect (and personalized) letter, edited to fit your personal situation. If this letter does not fit your requirements, please also have a look at the topic: Leave Letter Templates. How to draft the perfect Leave letter? Check out the informal and formal leave letter samples and use them for your own convenience.